Jan. 19, 2017 (Norfolk, Virginia, USA). 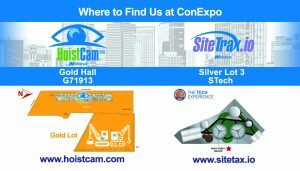 Netarus, LLC, maker of the HoistCam™ (www.hoistcam.com) platform of remote camera monitoring systems, has been selected to participate in the inaugural Tech Experience at ConExpo-Con/Agg 2017, March 7-11 in Las Vegas with SiteTrax.io (www.sitetrax.io). Intended to highlight emerging technologies that enhance safety, productivity, and profitability, the Tech Experience is a new 75,000-square foot venue for construction industry thought leaders to demonstrate the future of construction. SiteTrax.io builds on the features of HoistCam™ Director fleet monitoring software. By providing a centralized monitoring point, HoistCam Director allows construction owners and general contractors to view and manage hundreds of job sites or equipment operations, improving productivity and safety. “HoistCam Director and SiteTrax.io will allow the construction industry to be more strategic with its decision-making, including situational analysis and awareness, improving safety, productivity and profitability for contractors,” said Machut. 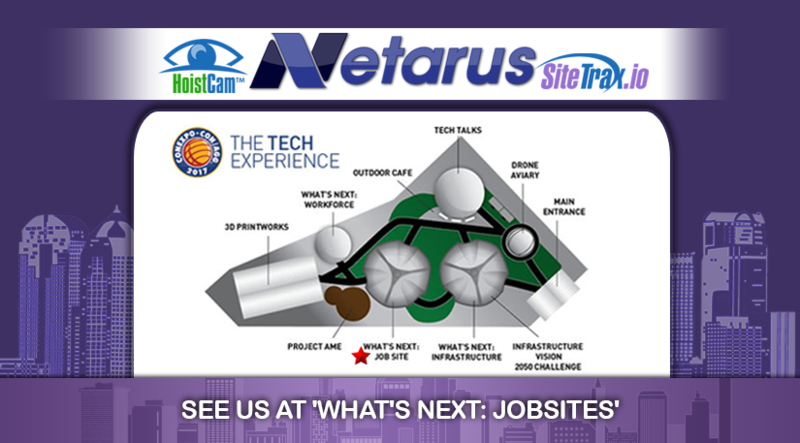 Look for hands-on demonstrations of SiteTrax.io in the “Imagine What’s Next: Jobsites” vignette in the Tech Experience – Jobsites, located in Silver Lot 3. 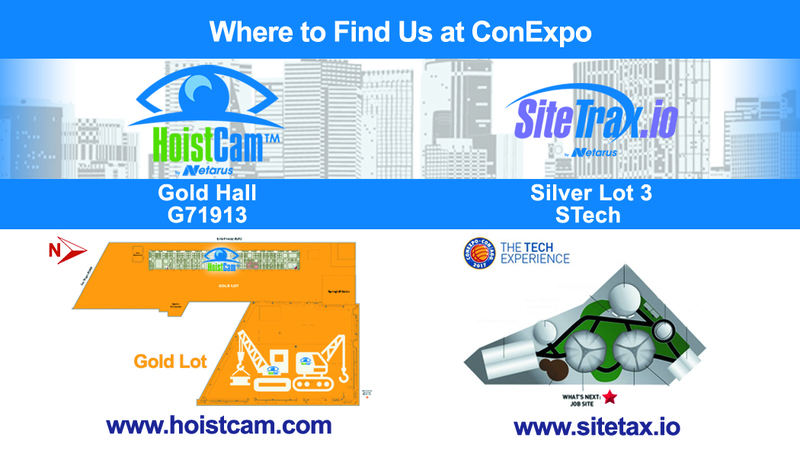 In addition HoistCam cameras and HoistCam Director will be exhibited in Gold Hall Booth G71913. Live cameras will also be on display on several crane exhibits. Confirmed locations will be posted on HoistCam’s exhibitor directory listing on the ConExpo website..
Netarus manufactures and sells industrial-grade video monitoring solutions which improves employee productivity and workplace safety in the construction, industrial, marine and transportation industries. HoistCam™, a rapidly deployable wireless camera system, places the eyes of the crane operator anywhere on the job. Netarus’ HoistCam (www.hoistcam.com) platform suite provides remote monitoring, recording and management analytics reporting to operators and site supervisors. Netarus’ SiteTrax.io (www.sitetrax.io) provides real-time data analytics from camera systems such as Netarus’ HoistCam Director. ©2002-2019 Netarus, LLC. TugCam™, HoistCam™, SiteTrax.io™ and ThreeSixtyCam™ are trademarks of Netarus. All rights reserved. All other trademarks are property of their respective owners. Welcome to Netarus. We develop solutions that are easy to use, increase safety and productivity. Need to get in touch with us? Use the contact information below.